If you’ve read about how to make your own herbal tinctures and extracts, you know it’s really rather easy to do! I love making my own herbal remedies because it allows me to customize for my needs, as well as save money. 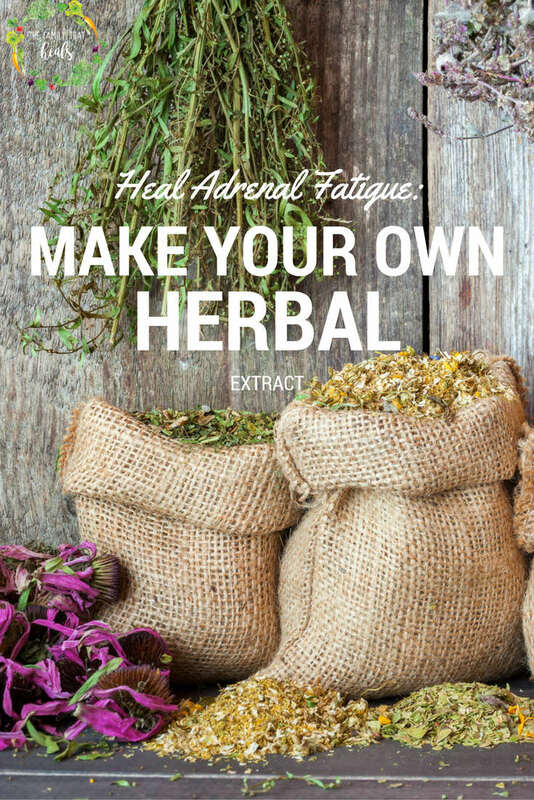 When I was working to heal adrenal fatigue, I learned about adaptogenic herbs that can help, so here, I’ll show you how to make an adaptogenic herbal extract to heal adrenal fatigue. Adaptogenic herbs (adaptogens) work synergistically with your body to bring it into balance. They adapt to your body’s needs, providing energy, but also bringing calm. Best of all, they reduce stress and balance cortisol levels in order to reduce strain on the adrenal glands. Rhodiola– Reputed to be more powerful than other adaptogens, rhodiola supports mental and emotional health by improving the ability to deal with stress, as well as increasing blood flow to the brain. It also combats the effects of excess adrenaline. Rhodiola is also helpful in improving sleep and acts as a sedative when taken in high doses. It improves immune health by strengthening killer cells, and helps to combat infection and stimulate detoxification. It is even anti-cancer, as it helps to prevent tumors, is antimetastatic, and antimutagenic. Astragalus– Another effective adaptogen, astragalus is helps to support the nervous system and negate the effects of stress. It is quite nutritive, as it contains protein, calcium, magnesium, silica, iron, and vitamins, all of which help to strengthen the body as a whole and impart energy. Astragalus can be used as a sedative and is also helpful as an antidepressant and antianxiety. It helps to regulate hormones, especially estrogen. Ashwagandha– Also helpful for calming the nervous system and promoting restful sleep, ashwagandha boosts strength and vitality. It modifies the harmful effects of stress on the body and promotes calmness. Ashwagandha is excellent for stress, anxiety, depression, panic attacks, insomnia, and exhaustion. Eleuthero– Known as “Siberian Ginseng,” eleuthero increases vitality, improves mental and physical performance, and protects against stress. It lowers blood-pressure and has powerful anti-fatigue effects. Eleuthero supports memory and concentration and promotes optimal adrenal function. If you want to make the ultimate tonic to heal adrenal fatigue, grab the above herbs and a bottle of booze and let’s do it! 16 oz of vodka or other good, strong grain alcohol. A clean, quart-sized jar with a tight-fitting lid. Put 4 oz of each herb in the jar, then fill the rest of the way with vodka. Affix the lid tightly and give it a gentle shake to distribute the herbs. Let the jar sit in a cool, dry place for six weeks (shake it once or twice a day during this time), before straining and putting in a tincture bottle like this. I take a dropperful in the morning, and sometimes later in the day if I can remember. It’s not impossible to heal adrenal fatigue! In fact, adding in adaptogenic herbs like those in this extract will have you feeling better soon. Extracts are twice as strong as tinctures, so I prefer making them for the higher level of efficacy. If you’re gluten-intolerant, look for an alcohol labeled gluten-free. 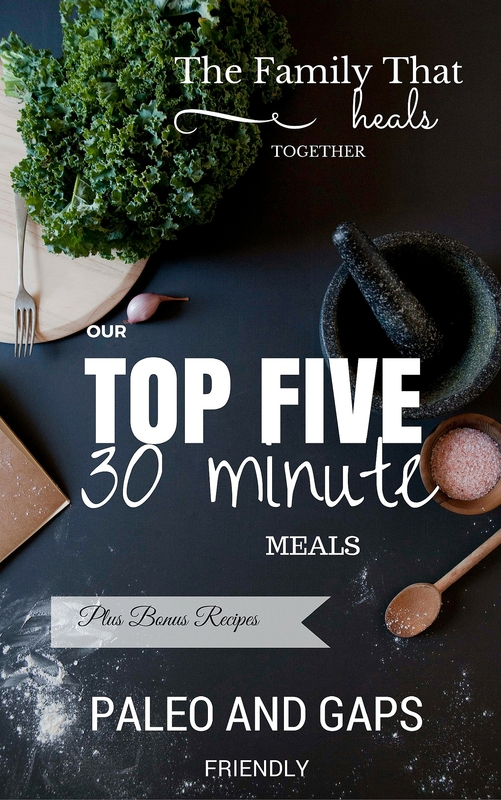 I’ve linked up top to one pound bags of each herb, and lower to smaller amounts. If you team up with friends to make this extract, you can probably save money by buying in larger amounts. Use the whole root, versus root powder because the powder will not be as strong and will be difficult to strain. Are you working to heal adrenal fatigue? What’s helped you? Share in the comments, then share this post using one of our links for friends who may also be working to heal adrenal fatigue! How did you know you were on the road to healing? How did you know you were healed? And lastly, do you do/take anything to manage adrenal health after you believe you’ve been healed from it? I started sleeping better, my energy levels improved, my hair stopped falling out, I was better able to handle my emotions and stress, and my blood sugar stopped roller coaster-ing. 🙂 I’ll still take herbs every day to support my adrenals, as well as most of the other things I’ve mentioned. Would you recommend this for children. Would this cause a person to get a little tipsy? Thanks so much! When looking for ingredients for this I went to Mountain Rose Herbs, where I get most of my herbs. While there, I found an extract with these ingredients: Ashwagandha root, Rhodiola root, Schisandra Berries, Eleuthero Root, Holy Basil, and Oat Tops. Do you know what benefit the other ingredients in this extract would have for adrenal fatigue? Would it be beneficial to buy this extract? I would like to do this alcohol-free. Have you ever tried making it with apple cider vinegar? I haven’t, but I know you can make herbal vinegars.